The Argweld® brand has been recognized for decades as a world leader in weld purging and pipe purging technology. Pipe Purging Systems are used when welding pipe made of Stainless Steel, Super Duplex, Titanium, Chrome, Inconel and other reactive metals. Argweld® pioneered the inflatable Quick purge dam systems which have been proven to be the fastest and most effective purging method for tube, pipe and pipeline weld joints, especially for larger diameter pipes. 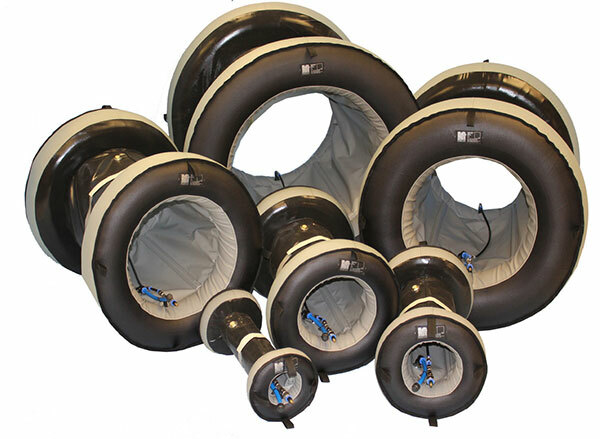 Due to their effectiveness, inflatable purge dam systems have rapidly been replacing other pipe purging methods and have become an industry standard. 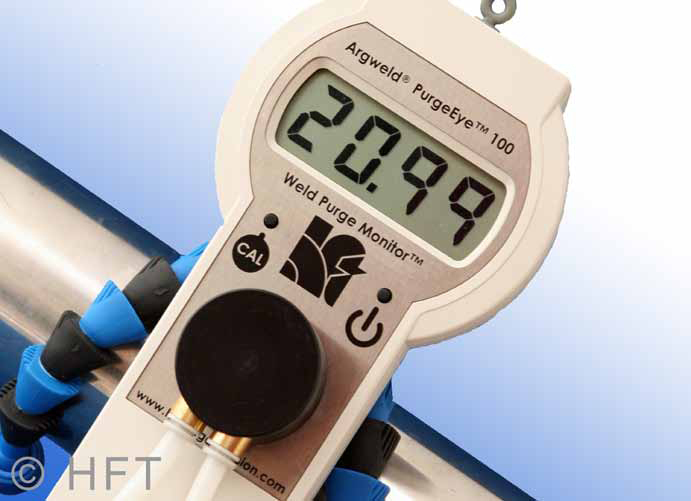 The Argweld® tradition of innovation and staying ahead of the competition continues with the release of the completely redesigned and improved Argweld® Quick Purge II. Quick Purge Systems are very effective and generally pay for themselves in a short period of time because of reduced purge time and gas usage but there have always been a couple of downsides with older / inferior designs of inflatable systems: the risk of overinflating and bursting the bladders, and the need to properly set and maintain the purge valves and fittings. The new Argweld® QuickPurge™ II design incorporates revolutionary technology that eliminates these issues. The all-new Quick Purge II is the first and only pipe purging system that is truly a “plug and play” system with no valves to adjust, no risk of overinflating bladders and no set up time required. • PurgeGate™ is a proprietary device that controls the gas pressure going into the bladders and makes it impossible to overinflate them no matter what the flow or pressure is going to the system. 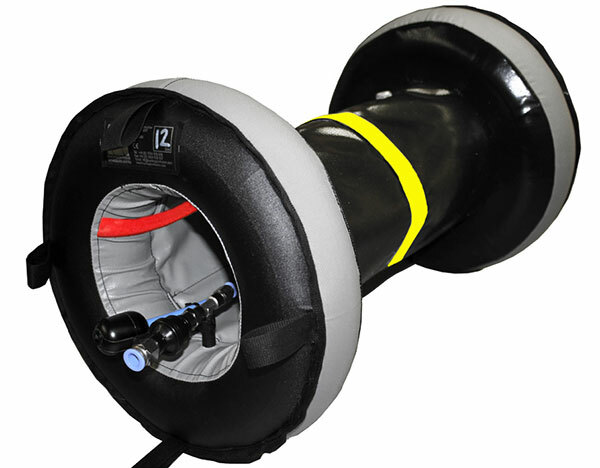 QuickPurge® II is the ONLY inflatable purge system with this technology. • The new IntaCal® gas release mechanism is a low-profile and precise device that is specifically designed to be used together with PurgeGate™ valves and sintered outlets to disperse the purge gas evenly into the weld joint area without turbulence. • Another new feature is the RootGlo® positioning strip which is a highly luminescent band that allows the operator to quickly and accurately position the QuickPurge® II purge system at the weld joint. RootGlo® absorbs enough energy from daylight to provide up to 12 hours of luminescence inside the pipe. In addition, RootGlo® does not off-gas when heated like other similar (cheaper) glow-in-the-dark strips that can contaminate the weld. Each QuickPurge® II system central collar and dam edges are made from an innovative new cloth which will withstand temperatures unstressed up to 550˚C (1022˚F) with a melting point of >800˚C (1472˚F). Three hoses are available, one for argon inflation and purge, the second for auxilliary purge and the third for gas exhaust via a purge monitor. 2. The purge gas is turned on and inflates the twin bladders, effectively isolating the area of the weld joint for a localized purge. The primary gas inlet is used to inflate the bladders and weeps through the IntaCal® mechanism, and the secondary gas inlet is used to increase the gas flow and volume as desired, providing a high-speed purge. The sleeve that connects the tandem bladders reduces the volume that needs to be purged which further helps reduce the time and gas required to achieve a purge. The air space between the bladders is purged by the inert gas, displacing the air and venting to the outside until the oxygen level is low enough to begin welding. 3. The flow of inert gas should be continued until the weld is completed and allowed to cool below oxidation temperature. 4. The purge gas is then turned off and the system will auto-deflate so the purge system can be removed from the pipe or pulled into position for the next weld. Don’t use home-made devices such as paper, sponge or foam that contain a high percentage of moisture and oxygen that can put your weld at risk! QuickPurge® II Systems offer a tremendous Return on Investment (ROI) by dramatically reducing the amount of time (man-hours) and the amount of purge gas required for each weld. *does not include bladder inflation time which can take a few minutes. water vapour and air, puts your weld at risk and end up costing you more money.